Water can be one of the most damaging elements to asphalt pavement because it has a lot of adverse effects on pavement performance. 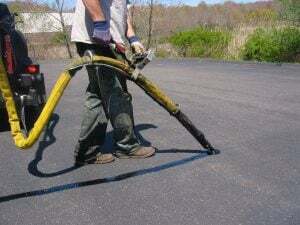 Moisture damage is decreased strength and durability of asphalt mixtures due to the presence of water. 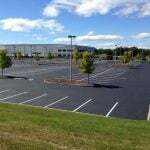 This usually occurs when the bond between the asphalt cement and the fine coarse aggregate is lost. As moisture penetrates this weakness, the damages and pavement deterioration are accelerated. When cracks form in asphalt, it allows for water to seep under the surface, which is damaging to the base beneath. Each time it rains and this happens, the weakness, damages, and pavement deterioration rate increases. This damage is often not visible from above, but the damages being caused are serious and can be costly to fix. If your leave your pavement vulnerable to water penetration for too long, potholes and other large structural deteriorations can occur. At the present time as the U.S. continues to experience climate change, these regular maintenances are particularly important. Climate change increases our risk of experiencing both heavy rains, and extreme droughts. If the cracks and flaws in your pavement are not properly maintained, the mass amount of water that is dropped during these large storms can do serious damage to your pavement’s base layer and overall structure. Additionally, these heavy downpours can lead to flooding, which means there are increased opportunities for outstanding water to lay on your pavement for extended periods of time. Even if your pavement is well maintained, this sort of flooding can be damaging to your asphalt, especially if not properly installed. Mix design – the mix design should be capable of handling environmental conditions, which includes exposure to water. Materials used to produce the mix and the gradation should be appropriate for the situation. Aggregate – Can affect the vulnerability of the pavement to moisture. The size and extent of the pores may cause water absorption. The chemical composition of the aggregate also has an effect on whether it is likely to bond to water or not. 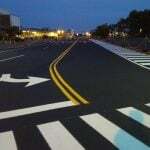 Gradation – This has a significant impact on the pavement dealing with water. A dense-graded mix should be pretty impermeable to water if it is compacted properly. Whereas, an open-graded mix is specifically designed to be permeable to water. In cases that an open-graded mix is used, proper drainage is extremely important. Additives – The impact of additives in an asphalt mix depends on the combination of ingredients used in the mix. Structure – A pavement’s structural design should be capable of dealing with moisture properly. This can depend on the correct density, slope, drainage, bases layers, etc. 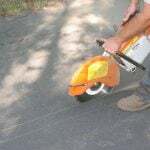 When hiring a professional paving company, they are extensively trained to understand the proper techniques, materials, and calculations for your particular project to ensure optimal water permeation protection. 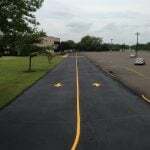 If pavement is not installed correctly, especially is the structure is done incorrectly (the base layer), the pavement’s lifespan will be significantly lower than it should be, causing premature pavement deterioration. Paving is a big investment and an important project, and outside elements like water can really damage asphalt. Because of this, having your pavement installed and maintained by trained professionals like those at EastCoat Pavement Services, is important in ensuring you get the most out of your pavement investment! Contact us today for your free paving consultation!